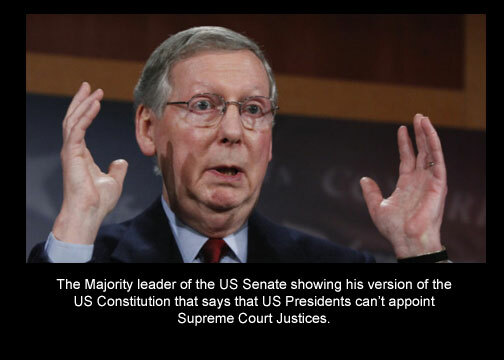 It seems that the Republicans in the Senate only want to pay attention to the US Constitution when convenient for them. To refuse to accept a nominee from the US President just because they don’t like it is very unconstitutional. They are refusing do to the job they swore to do. It’s pretty damn amusing when they do this upon the death of Scalia, who was all about the Constitution in its original form. One wonders if Scalia would counter this nonsense or decide to ignore his own principles as long as it got him what he wanted. Pretty clear, isn’t it? It seems Scalia would agree. “The theory of originalism treats a constitution like a statute, and gives it the meaning that its words were understood to bear at the time they were promulgated. You will sometimes hear it described as the theory of original intent. You will never hear me refer to original intent, because as I say I am first of all a textualist, and secondly an originalist. If you are a textualist, you don’t care about the intent, and I don’t care if the framers of the Constitution had some secret meaning in mind when they adopted its words. I take the words as they were promulgated to the people of the United States, and what is the fairly understood meaning of those words.” – A. Scalia, A Theory of Constitution Interpretation, speech at Catholic University of America, 10/18/96. This is the oath that these men and women took to become senators. For all of the claims of how the Republicans are so for the military and so religious that they wouldn’t consider ignoring their oaths, their actions show that they have no problem in ignoring anything as long as they can show how much they are afraid of President Obama. My husband is a veteran, as are my father and my brother. They served to uphold the Constitution. It is a shame that Republicans wish to disregard it whenever they feel like it, ignoring the basis of law in the US. Hypocrites? Shucks, why would you think that? (and yes, both parties do this. it doesn’t make it right). Addendum: wonder what the excuses are being offered by those Republicans who claimed that their god picked them personally to be president? This is truly disgusting behaviour. I hope it backfires immeasurably and they lose the Senate. Can I get a big” Hooooaaaah!” I totally agree. It surprises me that more veterans don’t speak out about this. I mean we took The Oath and put our lives in the harms way that they sent us. Yet time and time again they refuse to uphold theirs. Just because they cry about losing. They did the same with Clinton. And a big Hoooaah back at you. Brother was a Marine tank commander, husband an Army CE/sapper and father was a army missile man. Not that every one who has served has a clue, but sometime I think service (military or public service like the old PWA) should be required to get elected. Towards the end, it seemed Scalia too was eager enough to ignore the constitution in favor of his political preferences. although I still am with him on the Kelo decision. I really hate the way the SCOTUS ruled then. ahhh! my very first project at a nonprofit I worked at was about Kelo. Haven’t thought much about that in years. and most especially his religious preferences. It is perfectly fine for politicians to uphold the Constitution when it suits them. When it does not suit them…what Constitution? Kinda like creationists and facts.